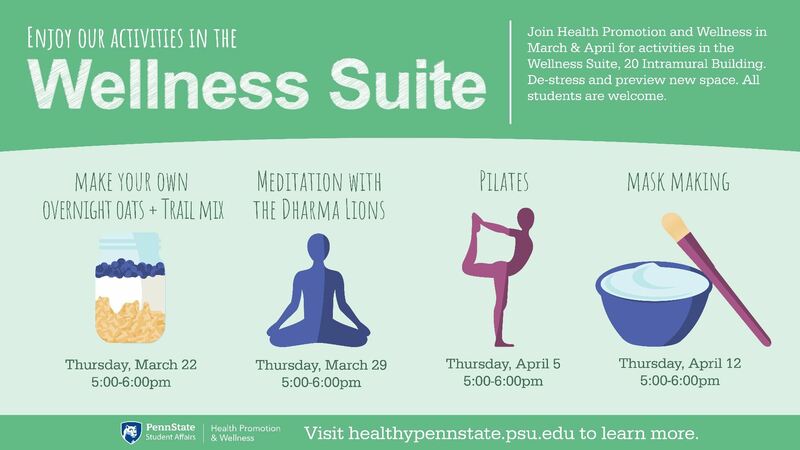 Enjoy end-of-semester activities at the new Wellness Suite. Visit 20 Intramural Building for stress reduction activities in March and April. Bring your friends and enjoy an hour of fun. All activities are 5-6pm in 20IM. During the month of March, there will be two fun and engaging activities. On Thursday, March 22nd enjoy making your very own overnight oats and trail mix! On March 29th come practice meditation with the Dharma Lions! Something we could all use as finals approach. If you cannot make any of the March activities, no worries! April also has two dates filled with fun and relaxation. On Thursday, April 5th come try out Pilates! On Thursday, April 12th experience how art can help with mindfulness. Create your own face mask and enjoy the comfort of the suite! Remember to check back in for more updates about activities happening in the wellness suite.